RE/MAX Associates, as a group, have more exclusive listings and more customers than agents with any other competing real estate network. Advertising. On average, Jim Chang spends about $1,800 per listing and about $20,000 on individual and group advertising. Personal advertising plus national television advertising and Internet exposure generates the highest number of prospects in the industry. The revolutionary RE/MAX Concept of enabling real estate professionals to maximize their business potential has evolved into an organization of more than 80,000 Sales Associates in more than 4,400 offices. RE/MAX Associates, on average, lead the industry in production and professional designations. The red, white and blue RE/MAX Balloon, with its "Above the Crowd!®" slogan, is one of the most recognizable business logos in the world. 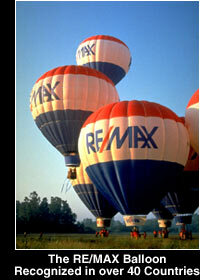 With more than 80 RE/MAX Hot Air Balloons around the globe, RE/MAX has the world's largest balloon fleet. RE/MAX was the first real estate network to be involved in more than 1 million transaction sides in a single year. Each transaction or sale consists of two sides, the listing side and the selling side. With offices in 43 countries worldwide, RE/MAX is one of the fastest-growing real estate franchise networks on the planet. Being locally owned and operated, RE/MAX offices are staffed with professionals who live in the area they work in. Thus, committed to their local community, they have a deep personal interest in the customers they serve. In a business environment of mergers and acquisitions, RE/MAX is the only major real estate network still owned and directed by its founders. The excellence of RE/MAX Broker/Owners and Sales Associates has led to an ever-increasing number of accolades from the business community at large. "Worth" magazine honored RE/MAX with its prestigious "Readers' Choice" award in both 1999 and 2000, naming RE/MAX the No. 1 real estate brokerage. 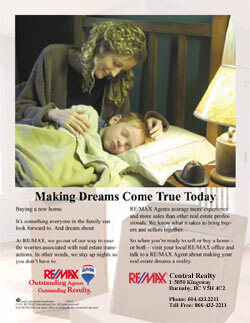 "Entrepreneur" magazine ranked RE/MAX the fastest-growing real estate services franchise in 2002. RE/MAX - now an established industry leader - celebrates its 30th anniversary in 2003 and looks ahead to even greater real estate achievement in the years ahead. When you choose a RE/MAX Sales Associate to sell your home or help you purchase a new home, you'll experience a whole new level of service. First, RE/MAX Associates are The Hometown Experts With a World of Experience®. Across the globe, they make their living in the same communities in which they live. They're the people next door, or just down the block. Consummate professionals, RE/MAX Associates lead the industry in advanced real estate education and production. That's why they're known as "The Real Estate Leaders®" and why no one in the world sells more real estate than RE/MAX. The proof of quality service is in repeat customers and in customers who refer RE/MAX Associates to their friends. RE/MAX Sales Associates average 70 percent of their business from repeats and referrals, while other agents average about 30 percent from those sources. RE/MAX Associates lead agents of competing companies in professional designations which denote specialized training and education. They dominate the Accredited Buyer Representative (ABR), Certified Relocation Professional (CRP), Certified Residential Specialist (CRS) and Leadership Training Graduate (LTG) ranks. That experience and education means RE/MAX Associates are better qualified to set the right price for the homes they list, are better equipped to market those homes, and are likely to find a buyer in a shorter period of time. That experience and education also means they are better qualified to find the right home for any buyer. As a result, the average RE/MAX Sales Associate out-produces competing agents three to one. Deciding to sell or buy a home is a big step. Make sure it's a step in the right direction by choosing the person best qualified to handle your real estate needs: a RE/MAX Sales Associate.